Joining the obstacle course racing craze, I hit the Savage Race for the second time this year. The course was brutal. Some of the obstacles took several tries to get through. My left leg cramped so hard after the race I could barely get back in my car. But I loved it. 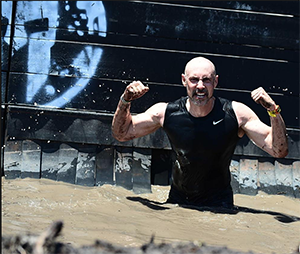 I took the challenge and fought through every obstacle, every mud soak and the 7+ mile run. Certainly, age is starting to become a factor. Turning 53 soon means I don’t heal as quick. I’m more busy in my work life than ever before and I don’t get up before the sun to go for a run. But the good news is I can scale myself against others in my age group. Placing 8th out of 110 in my class was passable. But a lousy 4 seconds haunts me. Four seconds quicker and I would have been 5th. After two hours and six minutes, all I had to do was sprint four seconds faster and I would have been in a much more tolerable place. 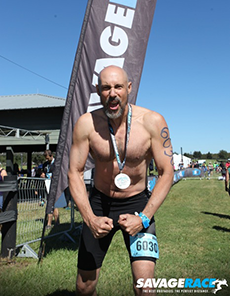 Sign up for the Spartan Race in December. Of course. You do a lot of thinking over two hours. You learn to stop listening to your body when its yelling that it’s time to quit, walk to the finish line and get a beer. It’s more about personal accomplishment. I jumped and hoisted myself across tall wooden walls. Crawled under barbwire that sliced cuts into my back. Trenched through giant mud pits that pull the remaining energy out of sprint weary legs. And pulled myself up by thick, coarse ropes knowing that letting go will hurt more than finishing. So you finish. So you finish one obstacle. Then another. Then another. Others run past you reminding you it’s a race and not a walk. You pick it up. You pass others that have endured enough temporarily. You keep moving. Fatigue becomes the enemy of confidence. And when you stand up against a warped wall of twelve or more feet, you launch yourself with all the confidence you can muster and tell yourself you will not fail. It’s a test of mind, body and spirit. All I have with me are running shorts, shoes and a bib with my race number. No phone. No Go-Pro (my choice). No fit bit. I was fully disconnected for the entire race. It was refreshing. When you think you’ve had enough, you see the finish line on the horizon. A few more obstacles and you’re home free. You cross the line with a surge of adrenaline that can be overwhelming. I beamed and smiled knowing I had done it. I implore you to challenge yourself. Test yourself. Complacency is sneaky. It creeps up on us when we’re not looking and settles in. Find something to test your character. It’s time to be brutally honest with yourself. The only thing I can tell you is to sign up for something stupid like I do and get out there. You’d be surprised what you can do. At how much more you can do than you realize. I recently took the challenge of dragging my carcass through the Savage Race mud a few weeks ago and it reminded me how I’ve learned to “cross apply” (rhymes with ‘multiply’) different aspects of my life. 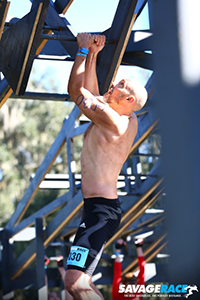 This obstacle course race was a good tune-up for American Ninja Warrior. Aside from having an immense amount of fun, I learned something. Actually, it really reminded of something. It’s easy to get caught up in the 7+ miles and 26 different obstacles you have to traverse, but if you don’t focus on the one at hand, if you don’t focus on one step at a time, you stumble. Duh, we should all know that. But taking the same focus, that same intensity elsewhere in our lives reminded me how I need to push the ‘outside’ away and focus on the item at hand. 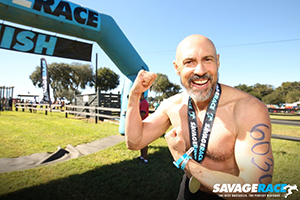 At the Savage Race, if you lose focus, you’ll probably splash into a cold mud puddle, quickly scraping to get yourself out. 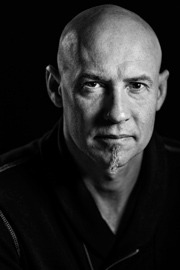 When I’m writing, I need to be ‘inside’ the story. So focused that I don’t miss the special details that can make a scene memorable. The acrid scent of burnt gun powder floating from the tip of the antagonist’s gun after he just shot a character I love. The screeching, almost scream-like sound that pierced the air as the antagonist sped away in his throaty Mustang still colored with two enormous black racing stripes running from hood to bumper. If I’m not focused, I don’t see, hear or touch these vibrant elements. And neither does your reader. That’s not to say that the reader’s imagination won’t fill it in with his own details, but you should still control the high-level aspects of the scene. And yet, we should learn to apply focus to all areas of our life. At work, it’s easy to get distracted. Conversations, walk-by’s. You have 128 new emails in your inbox and an instant message blinking its way into your attention. But stay focused. Finish one thing at a time. Humans cannot multi-task. So don’t try. In human terms, multi-tasking really means interrupting one task to start or do another. You’re really just bouncing around. Switching contexts. Because you switch contexts so easily, you think you’re multi-tasking. But you’re really not. Put a pencil in each hand and write your name. It won’t come out good. But if you focus with one hand and do it to the best of your ability, you’d be surprised at how beautiful you can write. Michelangelo painted with one hand at a time and look where it got him. Yep. Buried writing the second book. But that doesn’t mean I haven’t found a host of great sources and articles about amazing science discoveries. This one kind of freaked me out. You have to watch the video. To see this autonomous robot walk through the snow, pick items up off the floor and other things without being attached to anything. It is self correcting, even pulling itself up off the ground after one of the research team pushes it down on purpose. Thoughts of the Star Wars Clone Wars and all those droid soldiers quickly come to mind. Or I, Robot starring Will Smith. These ideas are not as far off as once imagined. But more than that, it’s great creative juice for writing. So many possibilities. Now get out and write that book. If you’re stuck for ideas, just search the web. So many things are happening these days. Advances in every field blossom almost every week. On a recent break from the stresses of modern day living, I had a chance to test my balance with an exceptional Yoga instructor we found in Lake Tahoe. Apparently, I have quite a way to go. But I was promised by the fact that when I did focus on my balance, I did better. As always, I thought, how can I translate this to my writing? But as I crack open Scrivener, I find I’m way behind schedule. First, I wanted to be done in time for this past Holiday season. Well, that didn’t happen. Then I thought maybe two-thirds of the way done by New Years. That didn’t happen either. What did happen, with fortune falling my way, was taking a short vacation after the new year having time to rejuvenate my writing. I sunk in and remembered why I love writing so much. Seems I’ve just been finding those old excuses not to get up at 6 in the morning to make a little headway, or to feel too tired to do anything at night. And then the weekends are just a chance to rest or something that doesn’t involve writing. I pumped out a quality chunk of about 10,000 words in 4 days – with more exciting twists and turns and so much fun that I’m putting in all those little times that help you GET IT DONE. Which is a goal we should never lose. Writing for yourself is primo. But if you never finish it, then no one will get the chance to experience that journey with you. So find your balance. It’s a new year. Don’t get lost in the haze of something, anything that’s keeping you from finishing your story. I’m sure it’s a story worth fighting for. I just wanted to say Happy Holidays to everyone! Having a terrific year with the sales of The Carrington Event doing better than expected. But as an added treat, I’m making the electronic version just $0.99 this week! I’ll also be posting some of my American Ninja Warrior training videos soon. I’ve turned up the training to help get my submission video tuned just right and will do everything I can to make the list early next year. Last year’s call from the Network putting me on the short list was hopeful, but you can’t use hope to buy groceries. I want the chance to compete. So stay tuned for updates over the next few months concerning the selection process. That’s the tagline from Amazon’s audiobook facilitator. I just started my first project and I’m so excited to get this done. I have many requests for audiobooks and now I’ll be able to respond. There are many sites that list helpful hints for doing this right. I don’t have them close to me, but thought I’d share the main site. I will update my site with it’s progress. I’ll also be preparing for the launch. Oh! And time’s almost up! My Kindle Countdown deal is running down. The Carrington Event is on sale for $0.99 for another day and a few hours. Pick it up for less than a dollar. It’ll rise to $1.99 after that and then back to $2.99 by next Tuesday.